Motivational psychologist Tara Well has created Mirror Meditation based the neuroscience of mirroring and psychological research on empathy, self-compassion, and emotional resilience. Mirror Meditation is a practice of looking at your own reflection in the mirror with no goal other than to stay present with yourself. The mirror can be a tool to develop kinder self-awareness. Tara and her research team are just beginning to explore on the effects of mirror meditation in the laboratory. Preliminary findings show that students who looked at themselves in the mirror for 10 minutes a day in silence with no goal other than to be present with themselves reported less stress and more self-compassion after just 2 weeks. 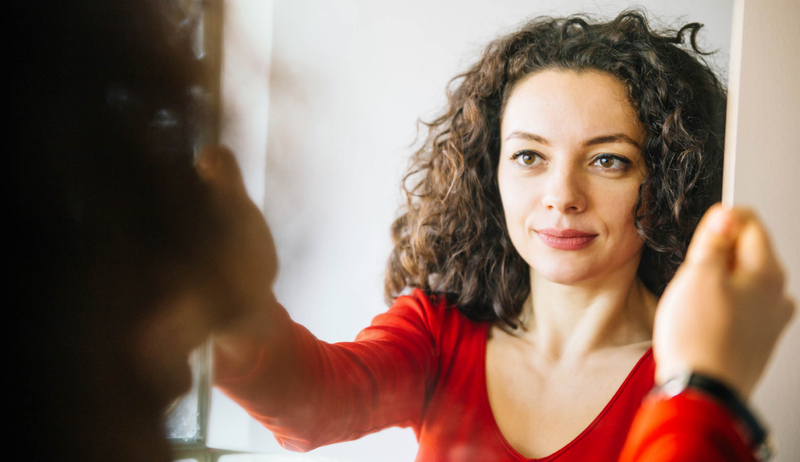 In narratives written about their experience doing mirror meditation, college women reported being more comfortable with their appearance, greater ease going without makeup, and more focus on how they were feeling rather than how they appeared to others. Is Mirror Meditation a form of therapy? Mirror Meditation is a short-term therapeutic technique. It is not a substitute for individualized mental health therapy provided by a licensed mental health professional. I do not claim to medically diagnose or prescribe treatment, nor am I a licensed therapist. I make no claim to cure, treat, diagnose or otherwise provide mental or behavioral healthcare. I simply serve as a facilitator and guide in your process of greater self-awareness and hold positive intention for your psychological and spiritual growth, health and happiness. 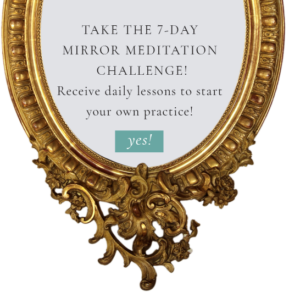 Is Mirror Meditation promoting “selfie” narcissism? Our research finds that Mirror Meditation does not increase narcissism. Instead, Mirror Meditation teaches you to support yourself by being more aware of your emotions, thoughts, needs, and desires. There is no need censor yourself, or to put on a show to entertain, or impress others. You do it just for you. You have the freedom to be any way you like – angry, silly, obnoxious, unreasonable, ugly, unfair, boring. By using Mirror Meditation to be honest with yourself in ways you might not want to express to others, you practice authenticity. Over time, this will lessen the need to seek validation from others. Without these agendas, you may have more genuine curiosity about others and be more present in relationships. Ironically, this is a less narcissistic, self-involved way of relating to others. What if I don’t like looking at myself in the mirror? Mirror Meditation might actually be very beneficial to you. People usually avoid looking at themselves because it is painful to do so. The pain comes from beliefs they have about what they are seeing. Seeing yourself in a mirror may activate a story about some aspect of your physical appearance. Seeing your own face may evoke feelings of shame, sadness, fear, or anger. Avoiding mirrors keeps you from feeling these negative emotions, while looking directly at yourself in a mirror may intensify those painful feelings. So it makes sense that you would want to avoid looking in the mirror. Yet not looking at yourself is like ignoring your best friend when he or she is in pain. How is Mirror Meditation related to other forms of meditation? Some traditional forms of meditation involve gazing on a fixed point, known as a Drishti. If you are a visual person, you may find that focusing on a still point makes it much easier to stay present than simply closing your eyes. In mirror meditation, you are your focal point, and of course much more complex than a spot on the wall. Seeing your own image will probably evoke emotions and stories more readily than fixed-gaze meditation. Your mind may drift, but it comes back to you in the mirror. 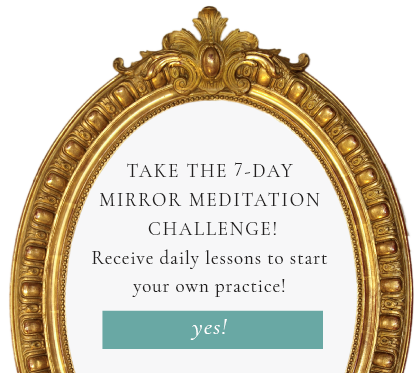 Mirror Meditation can provide a vehicle to learn the lesson that “Wherever you go, there you are.” (Jon Kabat-Zinn) If you do Mirror Meditation regularly, you confront yourself and your thoughts, as in other meditation practices – but from a new, more revealing perspective.